With the way this defense looks do not expect the Packers to win any games with Aaron Rodgers as a spectator. It is totally bizarre that the quarterback can make such a drab defense seem capable of going the distance. Many people preach the Packers defense possesses more talent than they show, but quite frankly, I just do not see it. Play makers make plays and this defense does not have the plasticity of doing so. Dom Capers is a huge problem. His conservative zone coverage and slow developing blitzes have gone stale. Problems that will lead to this being his last season in Green Bay. A mid-season fire would be uncharacteristic of the Packers and the organization would lose the faith of the locker room. Not that their morale could get much worse. Matthew Stafford looked like he’s won the last three MVPs after completing 26 of 33 passes for 361 yards and two TDs. His quarterback rating was near perfect at 132.4. Post game Mike McCarthy had the temerity to say, “I know what we have to do to play better.” Are we to believe these will be ground breaking adjustments that will be implemented in four practices? Don’t drink the Kool-Aid, folks. Mike has no idea how to fix the Packers defense. Much like the game vs New Orleans, Green Bay was dominated in time of possession. Detroit held the ball for 13 more minutes. They were 8-13 on third down to the Packers 2-9. The Packers had to run the ball effectively to control the tempo of the game, but they failed to that as well. Aaron Jones was a no-show after the first quarter in which he ran the ball four times for nine yards. Ty Montgomery displayed better vision carrying the ball for 6.6 yards a pop. However, he only saw the ball five times as the Packers were in a deep hole on the scoreboard. No matter what the offense did well, Capers’ defense gave them no chance. Stafford got whatever he wanted when he wanted. On balls that traveled 10 yards in the air, he completed 10 of 14 for 168 yards, per PFF. Much of this due to the fact he had all day to throw in the pocket. The pass rush only put their hands on Stafford three times and only one of those resulted in a sack. Stafford is not used to this kind of protection after suffering through 25 sacks prior to this game. The fourth most sacks taken in the NFL. When he has protection Stafford is incredible. Last night his passes were right on time and never off the mark. Damarious Randall had a chance to stop a touchdown to Marvin Jones on an 11-yard fade, but failed to get his head turned. 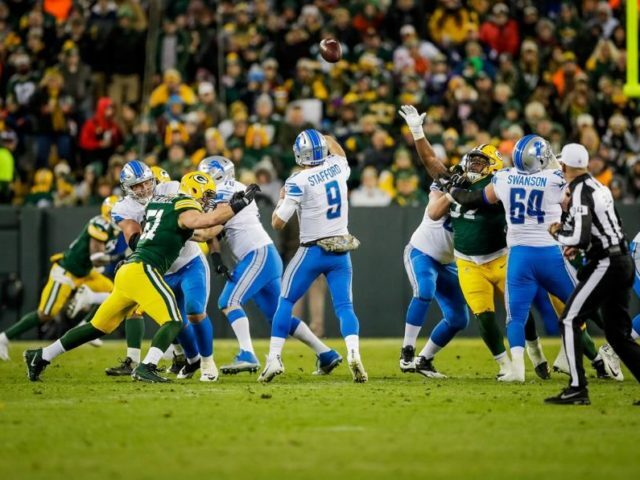 An absolute dime that gutted the Packers as the Lions went up 27-10 midway into the 4th. If kudos were to go out to any Packers you may offer them up to Brett Hundley and Randall Cobb. Hundley completed 68% of his passes with one going to Cobb for a 46-yard catch and run to set up a touchdown. Cobb’s 5 catches for 58 yards is the most production he’s seen since week 2 (6 catches 60 yards). 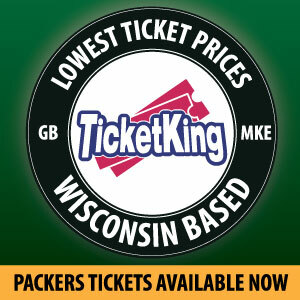 The Packers will take on another NFC North foe in the Chicago Bears next Sunday. Another team trying to find an identity with a new quarterback. I wonder who will get closer in doing so. This entry was posted in Brandon Carwile and tagged Brett Hundle, Damarious Randall, dom capers, Lions 30 Packers 17, Marvin Jones, Matthew Stafford, mike mccarthy, MNF, NFL 2017, Packers Defense, Packers vs. Lions, Randall Cobb. Bookmark the permalink. McCarthy does know how to fix this; he just won’t. 2. Let Hundley Play. Look, if he’s your QB, then he has to be your QB. This is not chapter six of your dissertation from 2009 on running a football team. What’s the difference if you lose with some useless watering down of the GB offense or QB2 throws four interceptions? Still an L. So open it up. You’re going 5-11 at this rate anyway. Your article is correct. Stafford has no running game! We had zero answers with pass rush, screens, and 3rd downs. Stafford had no pressure!! Defense is confused, lost, and outsmarted most of the time. We we not get another win, which may be a blessing to cleaning house. Bears will beat the Pack 20-13, maybe worse. Gee, I hope I’m totally wrong, but I’ve got a bad feeling. Bears defense will kill us!